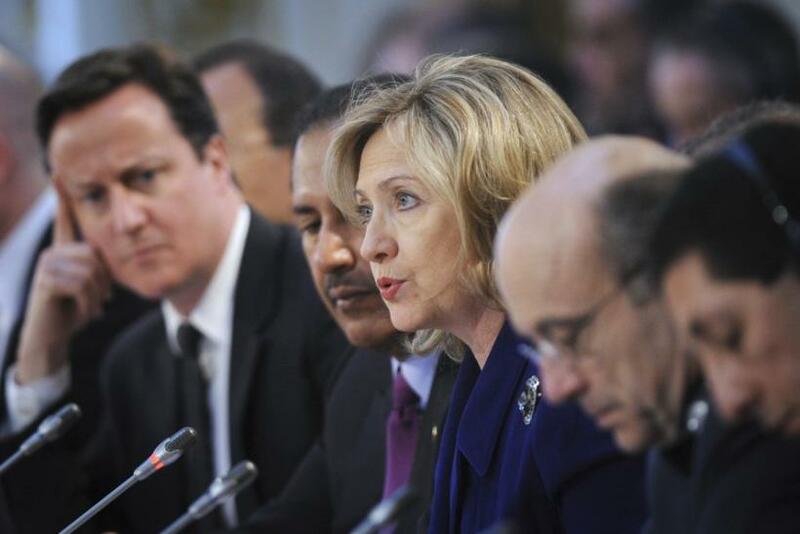 U.S. Secretary of State Hillary Clinton in London on Tuesday at an international gathering focusing on the political future of Libya, said no decision has been made as to arming Libyan rebels but said such an option was a possibility under a United Nations resolution passed last week. U.N. Security Council resolution 1973 authorizied protection of civilians by any means necessary, including a no-fly zone over Libya enforced militarily, but stopped short of requiring foreign troops on Libyan soil. It is our interpretation that 1973 amended or overwrote the absolute prohibition of arms to anyone in Libya, so that there could be a legitimate transfer of arms if a country were to choose to, she told reporters at a press conference following a day of meetings with European allies, Arab partners, and a member of the Libyan opposition about the political future of Libya. As I said, we have not made a decision at this time. The London Conference on Libya on Tuesday brought together representatives from various organizations with overlapping membership, including the United Nations, NATO, the League of Arab States and the African Union. On Wednesday, NATO - a coalition of North American and European allies - will assume command and control of all military operations to enforce an arms embargo, a no-fly zone and other actions if needed to protect civilians. Participants at the conference agreed there was a need for all Libyans to begin a political process to choose their future leaders, according to U.K. Foreign Secretary William Hague. The international community will work to support the process with the UN Secretary General Bank Ki Moon's Special Representative Abdel-Elah Mohamed Al-Khatib, he said. Humanitarian efforts will also be made to help 80,000 people displaced within the country. Qatar offered to facilitate the sale of Libyan oil and use funds to support humanitarian needs, in accordance with previous United Nations Security Council resolutions.